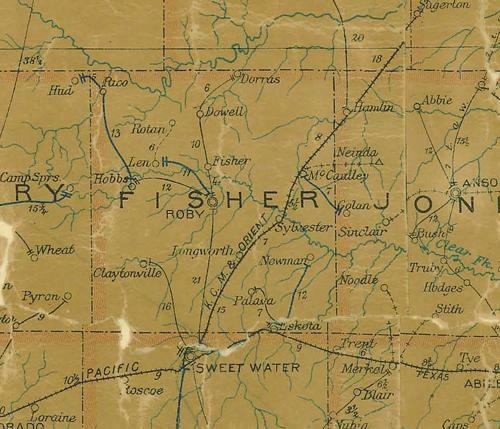 The town of Longworth appeared in 1902. Its name was an adaptation of the Long Ranch which subdivided its vast holdings in 1907. The small tracts of farmland were advertised in Northern newspapers (as was the custom) and many of the buyers were Bohemian immigrants who transmigrated from Pennsylvania. The Kansas City, Mexico and Orient Railroad arrived the same year (1907) that the ranch subdivived and may have been a factor. Gypsum deposits were discovered a few years later near Plasterco and many of Longworth�s residents found work processing the gypsum. In the mid 1920s more deposits were discovered much closer to Longworth. Information on the town in the Great Depression and WWII is not available but after the war Longworth was left with a respectable 200 residents and at least five businesses. As most small towns in Texas, the postwar boom did more harm to the town. It declined to just 65 residents and that number has been used through the 2000 census.